Members of East Shore’s many earth and social justice ministry teams gathered in the Sanctuary after the service on December 3rd to celebrate the work the teams have accomplished. We recognized that whether our teams are involved in short-term commitments or ongoing endeavors, we all practice love, explore spirituality – connecting to meaning greater than ourselves, and build community within our teams and with the community, as we do the work of promoting justice. 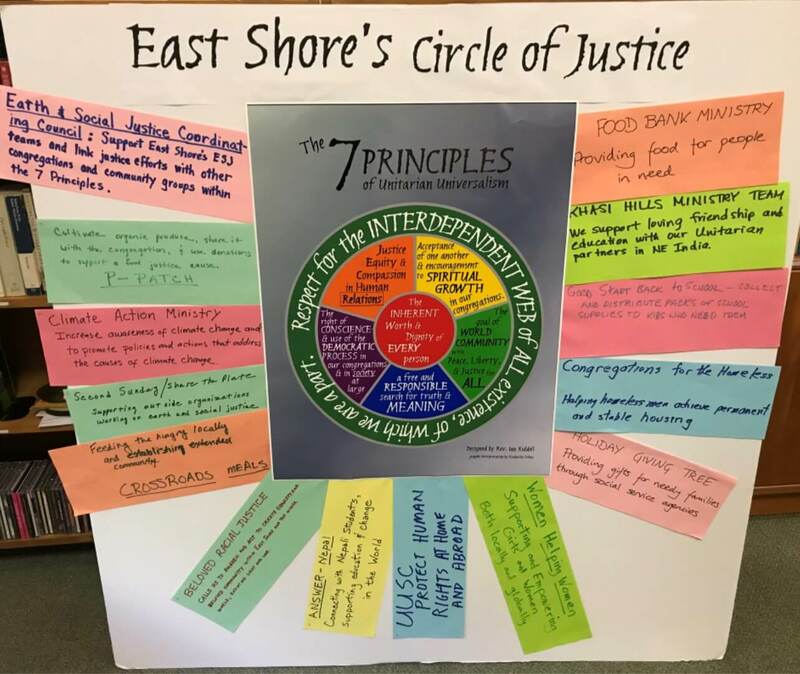 There are fourteen justice ministry teams forming the foundation of East Shore’s justice work, and you can learn about them from the Earth and Social Justice Ministry Team Pamphlet. The informal celebration began with a reading from Rev. Barber’s The Third Reconstruction highlighting the ways justice work such as economic justice, climate justice, and racial justice can come together united by a fundamental moral base. Because his words resonate with our Seven Principles, people felt connected to an inspiring vision of community as they realized how some of the teams’ activities overlap. For example, people from the P-Patch and the Food Bank connected around the importance of food justice. 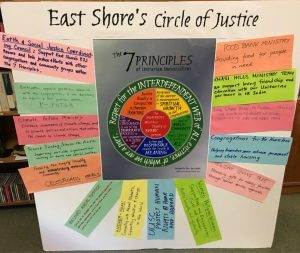 Using a poster of the UUA Seven Principles Wheel, team members created an East Shore Circle of Justice to represent the ways our spiritual values are put into practice. They each wrote a brief description of their team’s moral and loving mission and placed it on the Seven Principles Wheel. This Circle of Justice will be hung once it is completed. As the celebration drew to a close, everyone enjoyed informal conversation, cake, and stronger connections with other ministry team members. Watch for the East Shore Circle of Justice so you can appreciate the breadth, depth, and moral grounding of the justice work of this congregation.